Nestled along the shoreline of Lake Michigan, at the mouth of the Grand River lies the small community of Grand Haven, Mich.
Grand Haven is the heart of Ottawa County, where more than 65% of the county’s area is covered by water. So, as you weave around the small community, flush with trees and waterways, it is no surprise to see an abundance of bridges. Amongst the network of bridges, you will find one, the Stearns Bayou Bridge, with quite a unique story to tell. Stearns Bayou is one of many bayous feeding off the Grand River throughout Ottawa County. The area around Stearns Bayou is a nice mix of the past and the present. On one side sits Felix’s Marina and Gun Shop, a family-owned business operating on the bayou since 1929, while the opposite side of the water is dotted with contemporary homes. As you cross over the bridge along Green Street, it is common to see boats on the water or fishermen along the sidewalk. However, what many may not realize as they cross the bayou is they are traveling on a piece of North American history. The 420-ft-long Stearns Bayou Bridge, dedicated on Aug. 31, 1966, to replace an old one-lane wooden bridge, is the first hot-dip galvanized steel bridge constructed in the U.S. Hot-dip galvanizing (HDG) is the process of dipping fabricated steel into a kettle (vat) of molten zinc to produce an abrasion-resistant, corrosion-inhibiting coating. While galvanizing had been used to combat corrosion for more than a century, in 1966, utilizing galvanized steel in bridge construction was an innovative, untested approach. Some of the installation was done when the bayou was frozen, and trucks drove on the ice below. 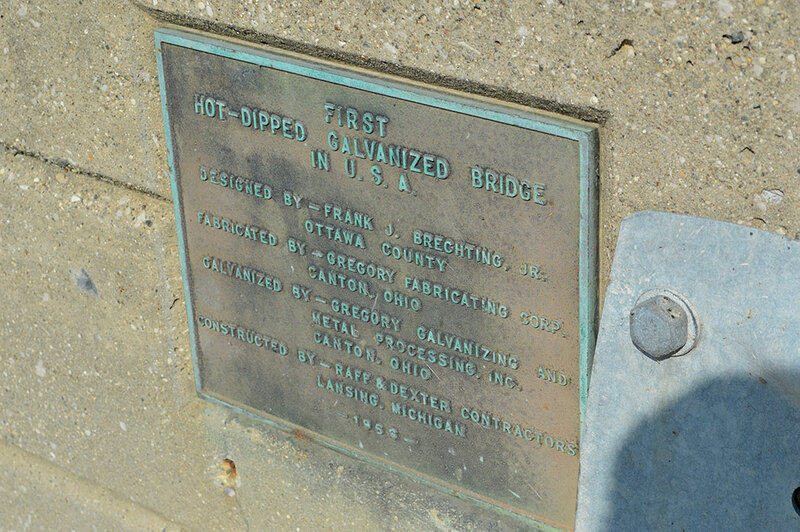 When Ottawa County Engineer Frank Brechting, Jr. designed the bridge with hot-dip galvanized steel, he was not chasing history, he was simply making a decision based on long-term economics. The 420-ft-long Bayou Bridge is the first hot-dip galvanized steel bridge constructed in the U.S. The Stearns Bayou Bridge consists of eight spans: two 60-ft and six 50-ft sections of 30-in., 108-lb rolled steel beams. In addition to the superstructure, all fasteners, handrails, diaphragms, shear connectors and fittings were hot-dip galvanized. When Brechting decided to specify hot-dip galvanizing, he believed galvanizing would provide the bridge maintenance-free corrosion protection for the first 25 years of its life. Considering the relatively small premium ($150 in 1966) to specify hot-dip galvanizing instead of paint, he knew the taxpayers would recoup the money over the life-cycle of the bridge. In fact, estimates at the time, based on a 20-year paint cycle and 5% inflation, showed the first paint maintenance would have cost approximately $17,250—a cost not necessary if the bridge was galvanized. Throughout the years, Brechting’s beliefs have held true. In 1991, at the 25-year anniversary of the bridge opening, an extensive inspection was conducted. To date, no maintenance had been done to the hot-dip galvanized coating. Visual observations on the underside of the bridge, both from the water and road sides, did not find any signs of corrosion or staining. During the inspection, it was noted that galvanizing had been particularly effective at the splice joints and bolted connections, critical areas which tend to fall victim to crevice corrosion on painted bridges of the same age. The railings on the top side of the bridge had begun to show weathering and some brown staining, most likely due to the road salts used to treat the roads and snow that may have been plowed onto the railings. During the 1991 inspection, approximately 500 coating thickness measurements were taken at various locations along the bridge. At that time, the main structural beams had an average zinc coating thickness of 6.2 mils, with a minimum of 4 mils and a maximum of 10.5 mils. The other elements of the bridge, such as diaphragms, bearing pads, etc., had an average of 3.7 mils, and the railings (despite the staining) had an average coating thickness of 3.34 mils. Based on those measurements, and the corrosion data available at the time, estimates held that the bridge beams would not need maintenance for another 90 years, while the other elements (railings, diaphragms, etc.) would not require maintenance for another 50 years. The historic bridge was dedicated on Aug. 31,1966, to replace an old one-lane wooden bridge. In August 2017, nearly 51 years to the day it was dedicated, the Stearns Bayou Bridge was once again inspected. During the visit, the American Galvanizers Association (AGA) interviewed current Ottawa County Road Commission Project Engineer Brandt Homik about the performance of the bridge. Homik stated the bridge deck had been recently replaced, but no maintenance has been done to the hot-dip galvanized coating. During the visual inspection, no corrosion was apparent on the superstructure beams or underside of the bridge; in fact, the galvanized steel still bore a spangled appearance. The railings on the top side of the bridge still showed significant signs of weathering and brown staining, but no red rust. Coating thickness measurements were taken on the deck rail, fascia stringer and stringers underneath the deck. The average zinc coating thickness for the rails was 3.31 mils, showing minimal change from the 25-year inspection despite the aesthetic staining. The fascia stringer had an average of 5.98 mils, and the interior stringers an average of 5.63 mils. Based on those readings, current corrosion data, and the rural environment where the bridge is located, this would suggest the bridge will not require maintenance for at least another 70 years—easily passing the 100-year bridge mark, which is a popular target today. The performance of the Stearns Bayou Bridge has shaped the Ottawa County Road Commission’s view of hot-dip galvanized steel. In fact, Homik noted the performance of the Stearns bridge directly affected the decision to hot-dip galvanize the reconstruction of the nearby Fruitport Road (Petty’s Bayou) Bridge in 2008. That 417-ft bridge was originally built in 1948, and has nine spans; seven 54.7-ft spans and two 17-ft spans. During the reconstruction of the bridge in 2008, the original beams were removed, shot-blasted and then hot-dip galvanized before being replaced on the newly constructed bridge. The bridge also was widened to include a pedestrian path, which required the use of an additional (new) beam on each span. The Stearns Bayou Bridge (1966) and Fruitport Road Bridge (2008) should shatter the long-held notion that hot-dip galvanized steel can only be used in short-span bridges. Although there are girder and beam limitations based on the size of the hot-dip galvanizing bath, simple design alterations can be specified to work with spans sized for the galvanizing kettle. In addition to building in sub-units that fit the galvanizing bath in one pass, it is possible to progressively dip the steel—coat one side, rehang and coat the other—to allow for longer spans. With the continued focus on building 100-year bridges, these two Ottawa County structures are real-world examples of how to accomplish that with hot-dip galvanized steel. After more than 50 years, the Stearns Bayou Bridge stands as a testament to the maintenance-free longevity of hot-dip galvanized steel. The life-cycle cost savings of hot-dip galvanizing, which weighed into the initial decision to use galvanizing, have far exceeded the original engineer’s projections. Furthermore, based on the current coating measurements and visual inspection of the bridge, taxpayers will continue to benefit from Brechting’s decision for decades to come. 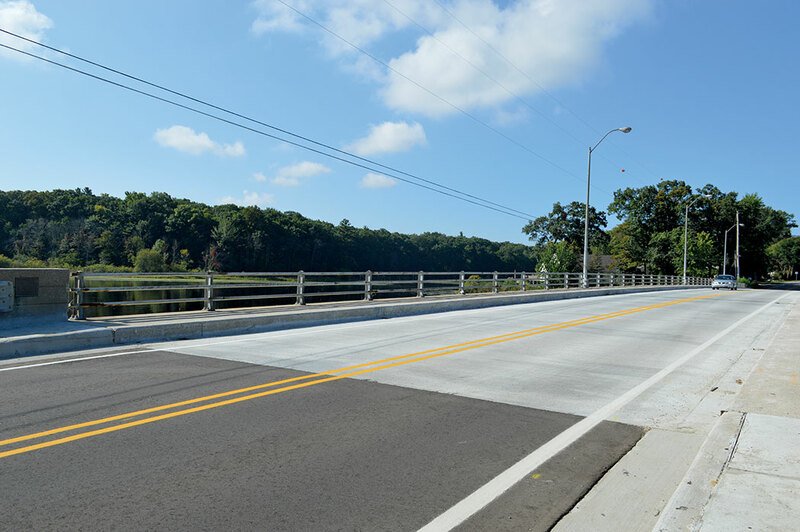 Regardless of how the scenic community of Grand Haven evolves in the next 25 years, one thing is certain: The first hot-dip galvanized steel bridge in the U.S. will be unchanged, still providing safe, maintenance-free transport across Stearns Bayou. Lindsley is marketing director for the American Galvanizers Association.